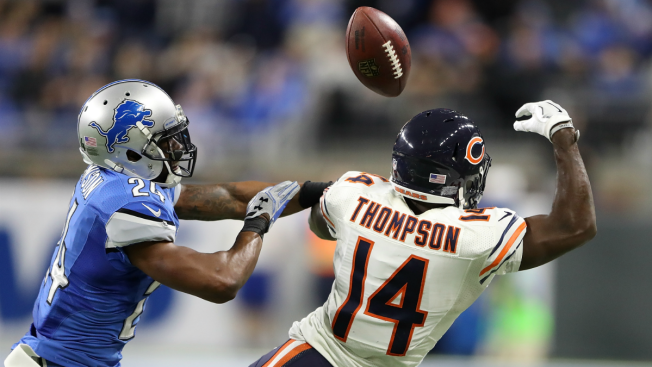 Nevin Lawson #24 of the Detroit Lions breaks up a pass intended for Deonte Thompson #14 of the Chicago Bears during fourth quarter action at Ford Field on December 11, 2016 in Detroit, Michigan. The Chicago Bears had an opportunity to win their game Sunday against the Detroit Lions, but their loss not only stung because of how close they were to victory, but it also marked a sad milestone as well. The Bears are now officially eliminated from playoff contention following their loss to the Lions. The loss put them at 3-10 on the season and makes them just the second NFC team to be eliminated from the playoffs, joining the 1-11 San Francisco 49ers in that exclusive club. Obviously, the Bears would have needed a lot of help to make the playoffs anyway, but Sunday’s loss merely made it official. Washington currently holds the second wild card spot in the NFC at 7-5, meaning that if they had lost out (including a game against the Bears in Week 16), then Chicago had a mathematical chance of catching up in that race. Even if that had happened, the Bears would have had to leapfrog eight other teams in order to get into the postseason. That would include three teams that the Bears have already lost to: Tampa Bay, Green Bay, and Philadelphia. As things stand right now, the Bears would have the fourth pick in the draft, pending the result of the New York Jets’ game Sunday against the 49ers.